St Bloggie de Riviere: Wot French News? Over my morning cuppa and cereal I do enjoy a nice read of a UK newspaper - usually The Times. Online, natch. You won't catch me paying 5Eur for a wad of out-of-date paper I can read for nothing, and on time, without having to leave the comfort of my dressing gown, on my computer. 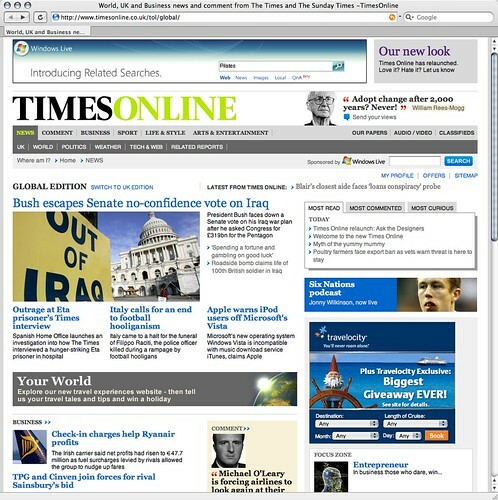 I like the look of The Times online; it has an authoritative but friendly type face and is easily navigable. The Telegraph is good too for its user-friendliness. But whither French newspapers? Wither French news? I can't say I'm a great follower of French news. Not because I'm not interested, but it's such hard work. The news on the tele is little more than a celebrity PPDA show (balding and trying not to show it with implants star newsreader Patrick Poivre d'Arvor) on TF1, and strangely inadequate on FR3. FR2 concentrates on local news with the national stuff on while you're trying to cook dinner. The other news programmes are on while you're trying to eat dinner when, in our house, the tele is off so we can meaningful conversations about the state of the world (ahem) or rather who's not talking to who at school on the sofa since the table has not YET arrived (it's being remade in India, due to be delivered week 19. When's that?? Why not say 'around May X?). The boys enjoy a quick blast on M6 but it's not what you would call a proper round-up of the day's news. Thus frustrated I went in search of the news online. You'd think it would be easy, wouldn't you? Just take the day's newspaper, design an attractive layout and bung on what's already been written. Well, try Le Monde's confusing and eye-bashing site. It's all close together and you can't tell in an instant what is where and what it's about. How about Libération? Well, there is so little on the 'front page' you wonder if there is actually any news in France worth mentioning. Taking two of the main news items on today's 'page' about Sarko, opened, they run to three paragraphs and roughly 100 words. Call that news? On the other hand, there are lots of remarks from readers, I suppose making up for the paucity in cover. France 24 is primarily a television site, so most of the articles are video clips. They may be great, but I just want to read for myself, quietly, and not wait for anything to download. On to the Nouvel Observateur, and today, the top news is about two kids who were lost at sea in Finistère. Right... If you look hard, you can find the 'real' newspaper stuff with other sections including the international one where, for example, today, the top story covers how there are anti-French demonstrations in Chinese cities. These websites have a lot of work to do if they are to rise to the standards of UK newspaper websites. You have to consider user-friendliness because if a reader can't find her way around easily, she'll just look elsewhere. It shouldn't be difficult because it doesn't have to be. It's just a question of design. Content, written in a non-tiring font is also important, preferably written without the self-importance of the journalist showing blatantly through. The Figaro is the most user-friendly. I read le Parisien - the national version is Aujourd'hui en France.